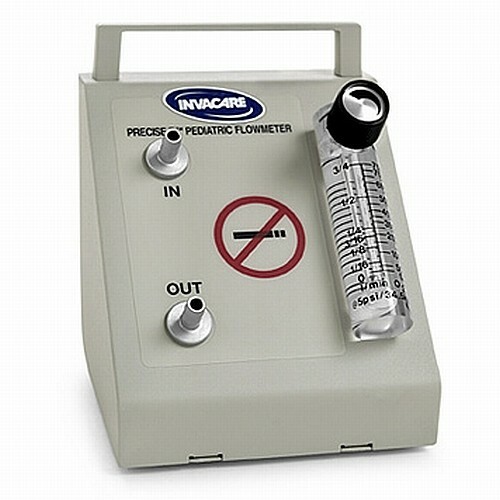 Invacare PreciseRx Pediatric Flowmeter - SHIPS FREE! The Invacare PreciseRx Pediatric Flowmeter is an adjustable system to help regulate the flow of air for respiration for younger patients. A doctor may make the suggestion of using an oxygen concentrator for a child. Since there are not many if at all, concentrators for children. The flowmeter works by limiting the oxygen going through the tubing. By connecting an oxygen concentrator through the flowmeter, you can adjust to meet a child's respiratory needs. A simple plug-and-play device removes the worry of struggling with complicated medical equipment. Turn the knob once you have connected the tubing, being sure to center the mercury ball to the setting required. If you are interested in a concentrator system, you may be interested in Invacare XPO2 Portable Oxygen Concentrator Accessories. Does it work with 10 litre per minute high pressure oxygen concentrator? Because this model maxes out at 7 LPM and a high-flow meter maxes at 10, this item will not work with a high pressure concentrator.